In January 2019 IESE researchers visited Stockholm to discuss with partners the economic evaluation of the measures implemented. The partners were also able to have a chat with KTH researchers about the technical evaluation. After this meeting the general feeling was that it is possible to evaluate the measures technically, economically and socially with the available data. IESE researchers also discussed the upscaling of measures and their replicability, which are an important part of this project. In this blog I will elaborate a little bit on the evaluation of measures in work packages 2 and 3 where evaluation data is available. What is happening in Valla Torg, Årsta and the Slakthus area buildings, what results do we have and what can be scaled-up? In Building 6F the total reduction in consumed energy was thus 94 kWh/m2 thus 72%. In Building 7G the total reduction in consumed energy was 44 kWh/m2 (36%). These figures are lower than expected, but they are largely due to the fact that the exhaust air heat pumps were not functioning before December 2018. The estimation for 2019 with fully functioning heat pumps is a reduction of 64% in consumed energy. In Building 8H the total reduction in consumed energy was thus 53 kWh/m2 (42%). These figures were also lower than expected, but they were also largely due to the fact that the exhaust air heat pumps were not functioning before the end of November 2018. The estimation for 2019 with fully functioning heat pumps is a reduction of 66% in consumed energy. If the estimated values for buildings 7G and 8 H are reached the average energy use per squaremeter in the first three evaluated buildings is 42 kWh/m2. 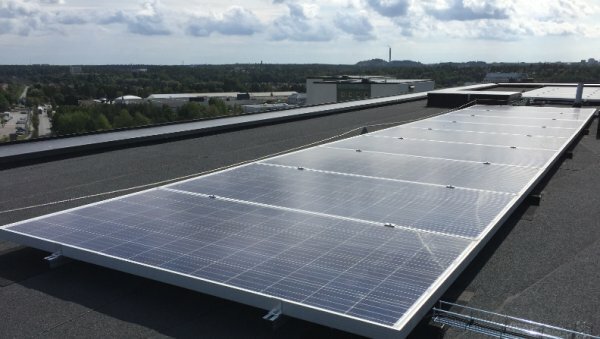 These are very promising results, considering that the original building is from 1961 and that the requirement for new-built buildings in Stockholm is 55 kWh/m2. As the results indicate, the technical solutions are indeed able to reduce the energy use in an old residential building by more than 70%, but it is economically feasible? We do not yet have the economic figures, so unfortunately it is too early to define if the refurbishment is economically feasible or not. I should be able to answer this in the next blog in May. There are other issues to consider. One of these issues is the u-value of the windows. The windows chosen in the project have a very low u-value of 0,7. In our northern climate this low u-value has meant that during special weather conditions more than half of the window has had frost on the outside. The frost indicate that heat is not leaking out the window, but for the tenant it is inconvenient when they cannot look out the window. In the private condominia Brf Årstakrönet the evaluation is on its second year. Compared to the 2015 baseline, the savings in 2018 was around -11% for district heating -13% for electricity (not including electricity used in apartments) and -3% for water. In Slakthus-area the refurbishment of building 8 is finalised. Compared to the 2017 baseline, the savings in 2018 were 49% for district heating. The baseline for electricity in 2017 is not comparable with the 2018 use as the function of the building has changed becoming amusic club which resulted in an increased use of electricity of 300% . The substitute building Kylhuset in Slakthus-area is also finalised for building related energy efficiency measures. Compared to the 2017 baseline, the savings in 2018 were 19% for district heating and 10% for building electricity. The production of electricity from photovoltaics is not available yet 2018, nor the recovery of waste heat from the datacentre. These do not affect the above figures, but they do affect the saving in total CO2-emissions. The smart LED-street lights (solution 5) have now been in operation for more than two years and the system works well. There are three sub-measures implemented and evaluated. I presented the results in my previous blog post but in summary the savings are between 14 and 46% depending on the sub-measure. The economic evaluation is not yet available, but in my next blog I will be able to talk more about the economic feasibility of this measure. The aim of the measure 5.2 is to implement in the city environment, if possible on existing infrastructure, sensors for data collection, analysis, visualization. Two types of sensors have been implemented in the Slakthus-area and have been operating for one year. The 10 sensors for measuring vehicle traffic on a real-time base have been functioning well and have provided accurate data. Some of the sensors were installed in existing infrastructure (a bridge, existing road signs), whereas others were installed on poles specifically set up for that purpose, as neither the traffic or light poles could bear their weight. As it is costly to install the poles, bring electricity and connectivity to them, it is important that the sensors can operate for a long period of time. Therefore we are currently working on extending the measurement time beyond the project time. The wifi-nodes were installed in buildings owned by the city and could use the existing connectivity (broadband) there. No additional cabling for electricity was needed as the wifi-nodes were connected with power over Ethernet (PoE). Theywere supposed to detect passing people in a very accurate way, but in reality did not do so. The issues were the sensitivity of the sensors, that regularly stopped working and the connection to people’s mobile device which was too long (between 20 seconds and 3 minutes) to determine if people were pedestrians, cyclers, or passing in a car. We are currently going through all wifi-nodes not providing data to re-start and/or replace them. We also add new wifi-nodes to provide additional data. 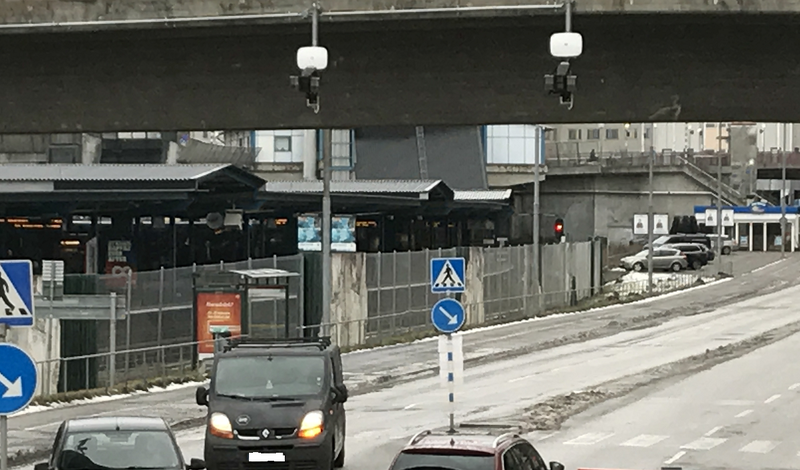 And as a third step IBM is installing multisensors to gather additional data about pedestrians and bicyclists in the Slakthusarea, as part of M8.1. The data from the sensors are analysed and visualised in the IOT platform provided by IBM. In the platform we have information about all sensors as well as a map (see below). IBM, who is responsible for the open consolidated big data platform (solution 8), has built up a multi-use data platform where real-time data can be analysed, but also were the data can be turned into practical usecases on reducing transport emissions and increasing the quality of life for citizens. Data flows from the sensor vendors’ systems via two separate entry points. The data is then immediately stored in the data lake for later processing but also fed online via the IBM Event Streams system for online processing, e.g. real time counting of unique visitors, or passages through the system. Implementation of a Big Data platform often impose a higher start-up cost for the first use case. Adding additional cases or increasing the usage of the same use case can lower the cost per unit of use case. This effect is basically a result of services or labour costs. The IT related platform cost (IBM Cloud) is consumption based and will have a low cost for the low volumes also at the start. The Measure is economically sustainable when we assume that the foundation would be used for more cases or at a larger scale. The Measure is installed in a limited geographical area with few sensors connected which makes the relative cost per sensor higher. Fortum’s open district heating (solution 6) system has two sub measures. The first sub measure is “waste heat recovery from data centers”. The data center is now having a load of 0,54 MW heat and will annually generate approx. 4,7 GWh (based on 8760 hours of operation/year) of heat. 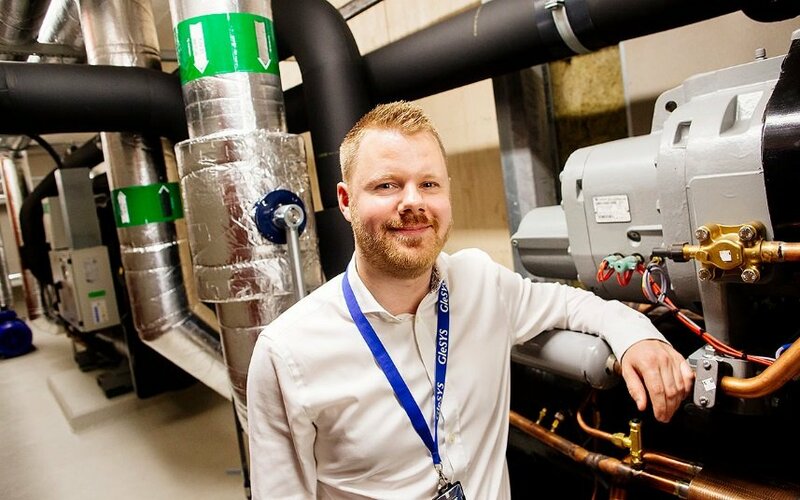 The heat reuse of the data center is expected to increase gradually to a level of approximately 1MW heat, a heat recovery that is sufficient to heat more than 1,000 apartments while reducing annual CO2 emissions in Stockholm. 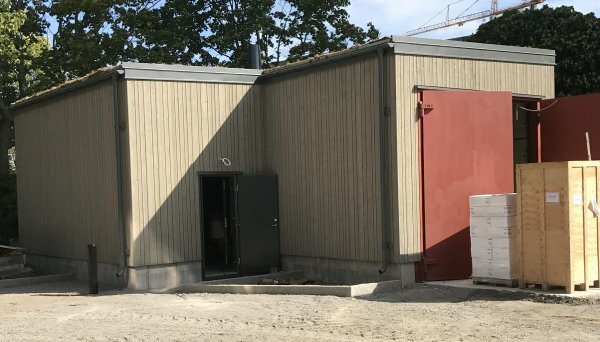 From the technical perspective, the main innovative solution applied to the data center is the heat pump model used, which is the first of its kind in Sweden. The heat pump is able to produce hot water at a temperature of 85oC instead of around 68oC. This is an advantage since a higher delivery temperature allows for more running hours in the district heating system, also during cold days when district heating customer SLA requires temperatures above 68C. This measure has been economical feasible for both the district heating company Stockholm Exergi and the supplier. 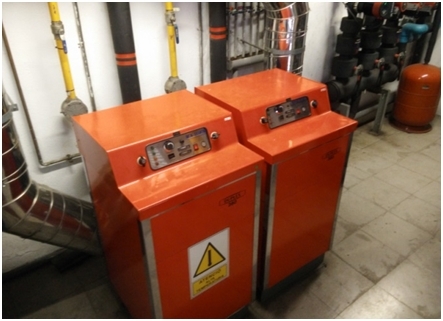 For Stockholm Exergi the recovered heat has been cost efficient compared to other production units. 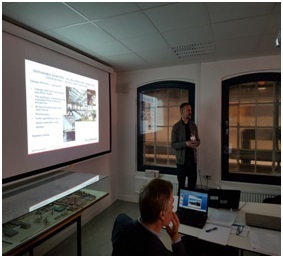 For a large-scale implementation of heat recovery into the district heating network Stockholm Exergi gains in other aspect such as avoiding peak production capacity investments and reducing operation and maintenance costs thanks to third party ownership of the production asset. For the data center, heat recovery generates a revenue stream from the waste heat that otherwise would be costly to get rid of. Since the datacenter had expansion plans there was an investment need in more cooling capacity. 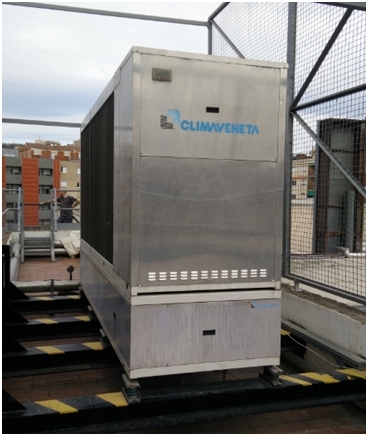 Instead of another conventional cooling machine, this heat pump solution with heat recovery was chosen. If you compare these two options this measure shows economical gains for the supplier compared to conventional data center cooling. Pay-back for the supplier will be within 5 years time but the economical values will remain over the total technical lifetime of approximately 15-25 years. The second sub measure is “waste heat recovery from fridges and freezers in supermarkets”. 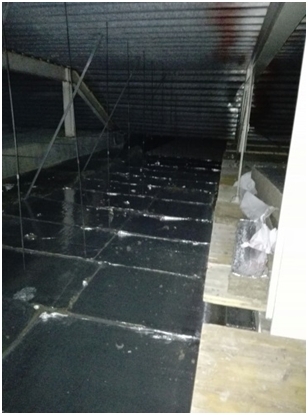 The studied supermarket had a heat recovery potential of up to 30 kW which would approx. generate 219 MWh annually. As long as the measure was in operation, during January to August 2017, the running time was over 99%, way higher than the initial aim of 50%. The conclusions regarding the sustainability of this measure shows that implementing heat recovery will contribute to decreasing the use of fossil fuels and carbon emissions independently of the electricity mix used when calculating the footprint. The economic feasibility of this measure could not be adequately evaluated due to the lack of data caused by the limited time of operation. The pay-back period for the supplier is estimated to be within 10 years’ time but the generation of economical value would continue over the equipment’s total technical lifetime of approximately 15-25 years. The waste handling system provided by Envac has been running since summer 2017. This solution demonstrates a smart waste solution for residential areas using differently coloured bags for different sorts of waste, transporting the bags long distance underground and sorting them automatically in a treatment plant. There are currently six inlets in operation in the installation due to the general time plan of the refurbishment of the Valla torg site. When the automated waste collecting system is in full operation there will be 13 inlets, thus increasing the amount of waste significantly, in turn making the evaluation more relevant. There is no data available for the sorting rate prior to the installation of the automated waste collecting system, so the sorting rate is compared to reference values from the Optibag sorting facility in the city of Eskilstuna, see table 1. Notably the residents in Årsta sort their waste better the residents of Eskilstuna. There is less rest fraction and more of organic fraction and paper packaging, even though there is slightly less plastic packaging. This is a good sign, since there were no sorting of organic waste prior to the installation of the AWCS in Årsta. The organic fraction can be used for biogas production, which in turn can be used in vehicles. So it is very promising that this fraction per quantity is the largest. A normal consequence of the installation of an AWCS from Envac is a substantial reduction of waste truck traffic in the area. This is also the result for the Growsmarter installation in Årsta/Valla Torg. The traffic in the area is reduced by 90%.With the available information the measure seems to be financially sustainable, if the present revenues are maintained along the life time of the asset. As the evaluation of measures in workpackages 2 and 3 shows, we do have some interesting results and measures which have a great potential for replication both in Stockholm and in other European cities. We will return to WP4 measures as well as WP2 economic evaluation in the next blog when I have this data available. With this I wish you a pleasant and sunny spring. Action area 1: Low-Energy Districts - What is happening in Valla Torg, Årsta and the Slakthus area buildings and what results do we have? In Valla Torg the refurbishment of the two first multi-storey buildings (7G and 6) and the low-storey building 8 are finalised and the tenants have moved in. The evaluation of energy use has started, but the first set of evaluation data is not complete, so it is too early to tell how well the energy efficiency measures have worked. Refurbishment of the other buildings are still in progress and will be finalised between September 2018 and January 2019. In the private condominia Brf Årstakrönet the evaluation is on its second year. The use of electricity, water and energy used for heating is evaluated. Each energy source is followed on a monthly basis and compared to the baseline. Also the amount of solar energy produced by PV cells are measured. 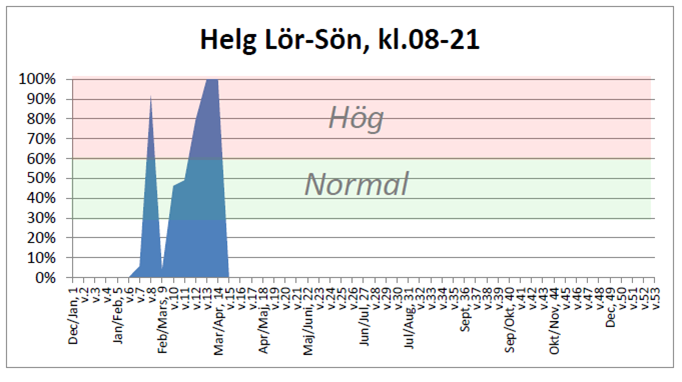 Compared to 2015, the first full operational year of savings was around -10%, for district heating -30% for electricity (not including electricity used in apartments) and -4% for water. In Slakthusarea the refurbishment of building 8 is finalised. The evaluation of energy use has started, but as the building and energy measures were so recently done there is no data yet available telling how well the energy efficiency measures have worked. The substitute buildings Kylhuset in Slakthusareaare also finalised for building related energy efficiency measures. The waste heat recovery will be installed in summer 2018 as well as the PVs combined with battery storage. The smart LED-street lights (solution 5) have now been in operation for 1,5 years and the system has worked well. There are three sub measures implemented and evaluated and the results for the first year of evaluation is presented below. It is important to understand that the baseline is LED-street lights. So the energy saving of replacing a metal halogen street 50 W with LED light of 30W is not included. This saving is about 30%. The first sub measure is “Sensor controlled LED lighting for pedestrian and bicycle paths” to enable the lights to provide base lighting to satisfy the feeling of safety at all times and increase the level of lighting when someone approaches. The first 12 months of evaluation indicate an energy saving of 45,9% a year. The original target of 40-50% savings was thus reached. The second sub measure is “Self-controlled LED street lighting with pre-set lighting schemes”. The first 12 months of evaluation indicate an energy saving of 14,4% a year. The original target of 20% savings was not reached in this first year. The third sub measure is “Remote controlled LED street lighting which can be controlled from a distance”. The first 12 months of evaluation indicate an energy saving of 19,3% a year. The original target of 30-50% savings was not reached in this first year. The next step will be to define how cost effective these sub measures have been. The aim of the measure 5.2 is to implement in the city environment, if possible on existing infrastructure, sensors for data collection, analysis, visualization and via an IOT platform also test the possibilities to use sensor data for direct communication to citizens as well as using flow data to pre-program and steer city infrastructure such as street lights. Two types of sensors have been implemented in the Slakthusarea. The first type is 10 sensors for measuring vehicle traffic on a real-time base and the second type are wifi-based sensors to measure pedestrian and bicyclist traffic. The data from the sensors are analysed and visualised in the IOT platform provided by IBM. Below are some examples of visualised data analytics. IBM, who is responsible for the open consolidated big data platform (solution 8), will build up a multiuseable data platform where real-time data can be analysed, but also were the data can be turned into practical usecases reducing transport emissions and increasing the quality of life for citizens. The development work is done in an agile process were users from different city organisations work together with IBMs development team. Currently the development team is working on developing a mobile application to help event visitors in the Slakthusarea to navigate in the area is a best possible way. In autumn the development team will start working with how the flow data collected could be used to steer street lights in the area. The waste handling system provided by Envac has been running since the summer 2017. This solution (Measure 7.1, 7.2, and 7.3) demonstrates a smart waste solution for residential areas using differently coloured bags for different sorts of waste, transporting the bags long distance underground and sorting them automatically in a treatment plant. There are yet only two inlets in operation in the installation due to the general time plan of the refurbishment of the Valla torg site. When the AWCS is in full operation there will be 13 inlets, thus increasing the amount of waste significantly, in turn making the evaluation more relevant. The organic fraction can be used for biogas production, which in turn can be used in vehicles. So it is very promising that this fraction per quantity is the largest. The Building logistics centre (solution 2) implemented by Carrier, will start handling more materials for the last buildings to be refurbished in Valla Torg. Unfortunately the evaluation data is not yet available, so it is not possible to define how well the solution is working. The implementation of delivery boxes (solution 9) by Carrier is done. The delivery boxes are actually a delivery room, which later on can be used for other purposes. The delivery room can be easily used for any type of deliveries, small and big. The deliveries are transported by bike to the room. When the package has arrived the tenant will get a message and with an app, open the door and then go and collect it. 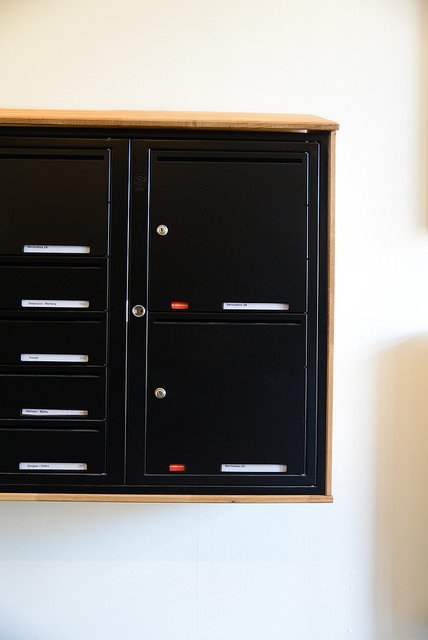 The tenant can also put returning packages in a special shelf. As the system has been in use for a short time, only a tenfold of packages were delivered. The camera surveilled room together with identification of users and specified door codes guarantee that a package is not accessed by other users by mistake. Insero has together with NOAE (Network of Automotive Excellence) implemented an information system for drivers (solution 10). Effects on travel time and the drivers’ experiences has not yet been evaluated. KTH has developed a smart phone application to follow up changes in travel behaviour. In the same application, information about renewable fuels in Stockholm will be shown. The application is launched, but no evaluation data is available. As part of the GrowSmarter project, Fortum will install up to 10 charging stations and one fast charger (solution 11). The fast charger is installed in Årsta. The normal chargers are also installed in Valla Torg. The first four refuelling stations for renewable fuels are up and running. The filling station in Årsta is expected to be built in 2018. Data from the first refuelling station shows some drastic results. The station was launched in 2016 as a renewable station and drivers did not think they could also get traditional diesel there. When they did understand this, the diesel sales increased. It is important to remember that only 10% of all trucks in Sweden are defined as green vehicles, so in that perspective 18% sales of biogas is a good result. 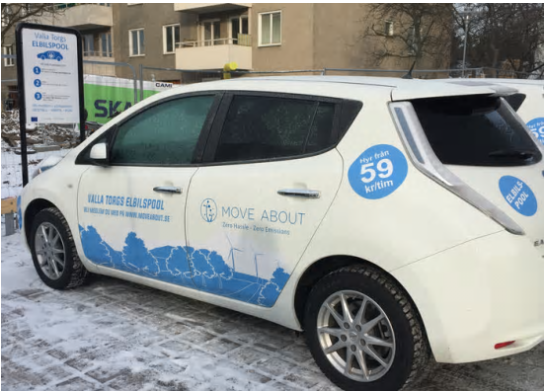 Stockholmshem launched its electrical carpool (solution 12) for tenants and habitants in February 2018. In February and March there were 14 tenants who have enrolled themselves to the carpool. The cars are frequently used especially during weekends. An event for tenants in Valla Torg was organised 18th of April 2018. 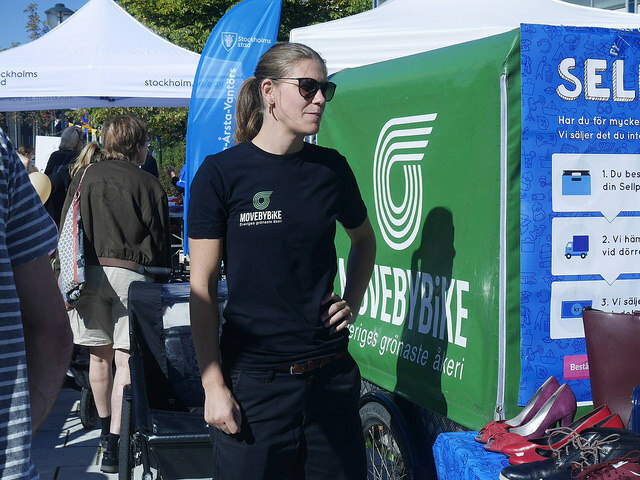 In the events Stockholm Site partners showed smart solutions for the tenants and they could also test solutions like the cargo bike. The event was successful and received positive feedback from tenants. All photos from the tenant event was taken by Bengt Alm. 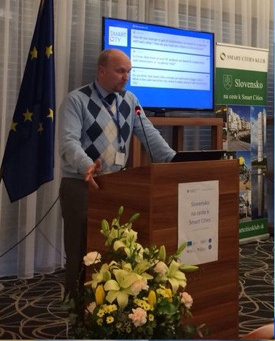 In Slakthusarea an inauguration was held 15th of May introducing the smart solutions implemented in the area. Some 100 persons from different organisations attended the event. It was a wonderful weather and the visitors had a possibility to both listen to presentations as well as see the solutions in practice in a study visit. All photos from the Slakthusarea event was taken by Sven Lindwall. With this I want to wish you a very nice summer. Read about how Barcelona has completed refurbishment works in several building complexes, including social housing buildings, student residences, a new library and more! Energy saving solutions have been implemented together with smart monitoring systems to track the new energy performance of the buildings. The solutions being implemented could be replicated across the city and have a considerable impact on the energy performance of Barcelona's buildings. Action area 1: Low-Energy Districts To see all the measures to be implemented, click here. Inaugural ceremony of newly retrofitted public library The refurbishment works on the public library owned by Barcelona Municipality, which are part of the GrowSmarter project, have been completed. 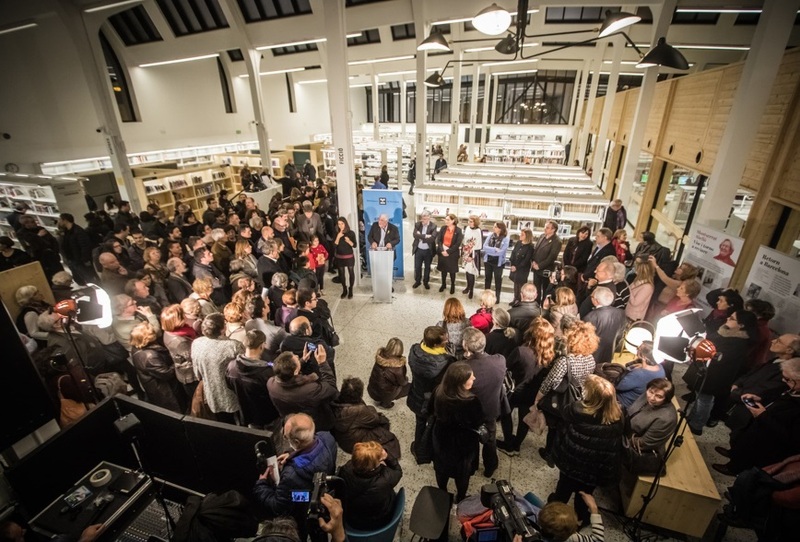 The inaugural ceremony of the Library Montserrat Abelló in the district Les Corts was held on 26th January with the attendance of the Mayor and other representatives of the City Council. Located in an old silk factory, the new public library is an example of the refurbishment of an industrial building owned by the Municipality of Barcelona. 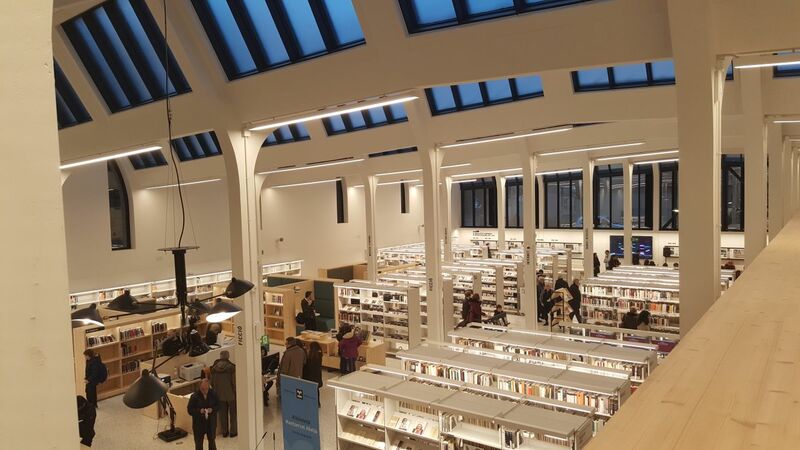 In this case, three adjacent buildings (an old industrial building most recently used as a warehouse and two office buildings) have been retrofitted to become the new public library of the district, a public facility of more than 3,000 m2. The new library is the first public building in the city of Barcelona with the BREEAM® (Building Research Establishment Environmental Assessment Methodology) certificate, a world-leading sustainability assessment method for buildings. In order to achieve this, the Municipality included energy efficiency criteria in the structural refurbishment of the building to reduce its environmental impact. The scope of the energy retrofitting works includes the improvement of the façade, roof, ground floor and glazing insulation to reduce the demand for heating and air conditioning of the building, the installation of radiant floor system for heating and cooling that contributes to the energy savings of the building, and the installation of software for the energy management of the building (BEMS). In addition, the library will cover part of its own electrical demand with a solar photovoltaic installation on the rooftop. To watch a summary video of the inaugural ceremony please click here. Works on social housing building finished by Barcelona Municipality The refurbishment works in the residential building of Passeig Santa Coloma 55-71, promoted by the public body responsible for social housing in Barcelona Institut Municipal de l’Habitatge i la Rehabilitació - IMHAB , were finished in December 2017. 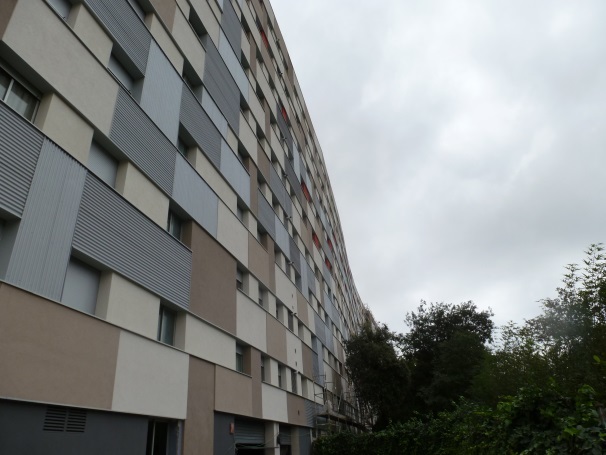 This building is composed of 207 dwellings with a total surface of 14,165m2, which will benefit from the passive refurbishment of the entire building façade. The insulation of the building façade is expected to lead to a reduction of the heating demand of the dwellings. The benefits for the tenants will not only be lower heating and energy bills, but also improved comfort and other qualitative aspects, such as noise and humidity insulation. In order to assess the impact on user comfort, a survey and monitoring campaign was done in February 2017 as a baseline, and a second survey and monitoring campaign will now follow in February 2018, since the insulation works are now finished. District heating connection between Melon District and DistrictClima Melon District Melon District Marina is the biggest student residence in Barcelona with more than 500 rooms. Melon District has a privileged location in the city thanks to its situation near the one of the most innovative neighbourhood in Barcelona, named 22@, as well as being just ten minutes walking from the centre of Barcelona. Connection to the DH&C: Before the refurbishment, the heating system in Melon District was based on electric heaters to supply the heat demand. After the refurbishment, all the electric heaters were disconnected and heat is instead provided DistrictClima. 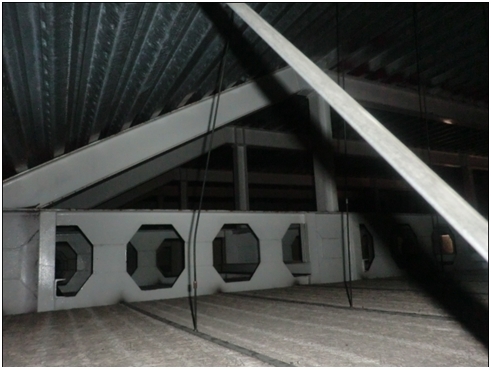 This connection to the district heating network, shown in the following pictures, allows to Melon District to considerably reduce its primary energy consumption thanks to replacing the use of electricity with the DH&C. Building Energy Management System (BEMS): A new Building Energy Management System (BEMS) was installed in Melon District, which will provide relevant information about the energy consumption of the building. The BEMS allows the property managers to understand the energy impact of the students' habits and reduce consumption through the application of new control strategies. Furthermore, the BEMS will help Gas Natural Fenosa to develop new strategies to better respond to disturbances or stresses in the system. A Home Energy Management System (HEMS) was also installed on one floor (B4) of the Melon building, which monitors the energy use of the four bedrooms and one kitchen on the floor. Thanks to the data gathered here, Gas Natural Fenosa will be able to disaggregate total consumption measured by the BEMs by each room and kitchen in Melon District. Together, these measures are expected to reduce the primary energy consumption of the building by 38%. Added value All the measures and works carried out in Melon District were part of an Energy Services contract, through which the Energy Services Company (ESCO) guarantees energy savings to Melon District as well as the correct operation of all installations for the stipulated period, in exchange of an annual fee. Moreover, thanks to the Gas Natural Fenosa’s background and its large range of different clients, the project carried out in Melon District will be easily replicable beyond what has been demonstrated in GrowSmarter, multiplying the beneficial impacts of the project. Last but not least, all data obtained by BEMS and HEMS will be fundamental to assessing the energy savings guarantees, thus improving the know-how of Gas Natural Fenosa and allowing Melon District to be more self-sufficient in its energy consumption. Action area 2: Integrated Infrastructures Action area 2: Integrated Infrastructures To see all the measures to be implemented, click here. Smart solution 8: Big data management In Measure 8.2, we have added data access and query functionality beyond what GrowSmarter proposes. Concretely, we can now query and cross data from more than one source, in this case from the GrowSmarter API and from other triple stores containing Barcelona urbanistic data (where data is in RDF/OWL format). This is a first step towards integrating Linked (Open) Data. Csíkszentmihályi, who defined the state of flow, has said, "If challenges are too low, one gets back to flow by increasing them. If challenges are too great, one can return to the flow state by learning new skills.". Even if it is often referred to a personal state of mind, it could also be put in the context of the smart solutions implemented as a joint effort in Stockholm. Most of the solutions in Stockholm are implemented the first time in a larger scope, with high goals and a very tough schedule, but they are also very tightly linked to each other. Now that the implementation phase for most parts is over or in a repetitive phase it becomes evident how challenging the project actually has been and how it has required developing new skills. Now we are stepping out of this state of flow and starting sharing our experiences. And I think we have a very interesting story to tell. In Valla Torg the refurbishment of the two first multi-storey buildings (7G and 6) are finalised and the tenants have moved in. The evaluation of energy use has started and will continue until the end of the project to secure a 2-year evaluation time. 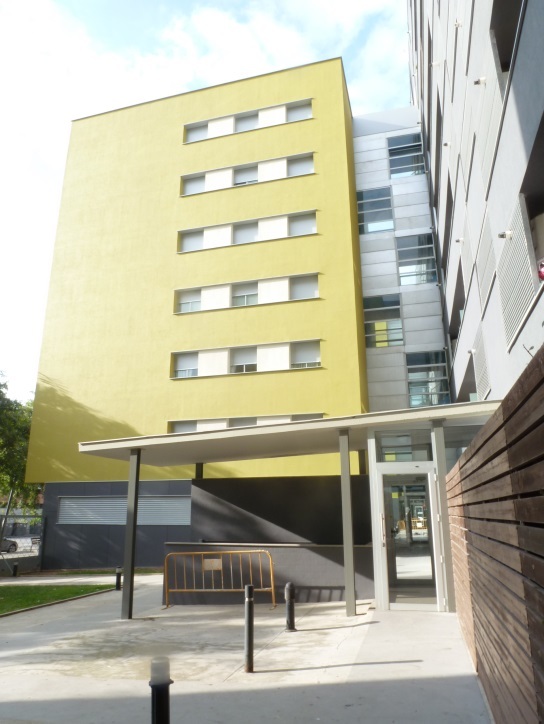 The second half of the low-storey building 8 is finalised and tenants have moved in. In the private condominia Brf Årstakrönet the evaluation is on its second year indicating clear energy savings. In Slakthusarea the refurbishment of building 8 is finalised. 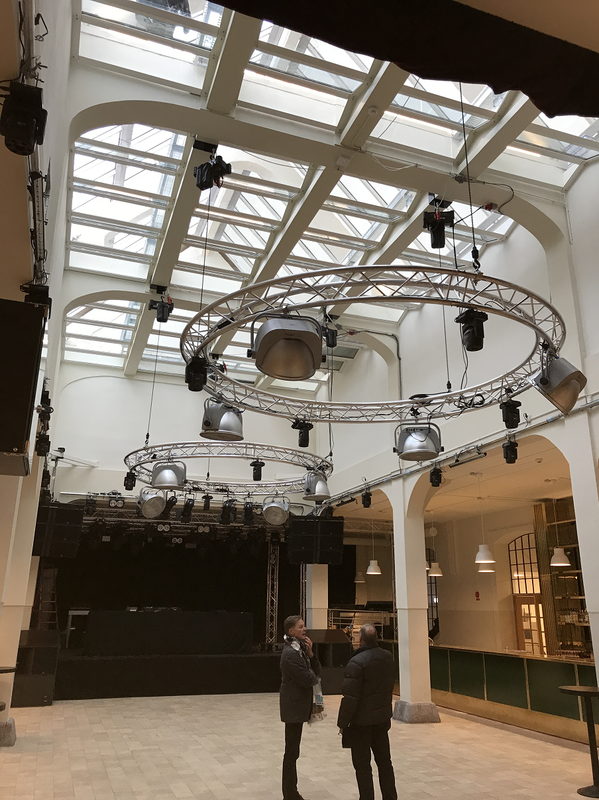 The new tenant, nightclub Slaktkyrkan, is open and have a full schedule of live shows planned for this spring. The pictures below show some of the energy efficiency measures implemented. The substitute building Kylhuset in Slakthusarea is also finalised for building related energy efficiency measures. The waste heat recovery will be installed in summer 2018. The smart LED-street lights (solution 5) have now been in operation for 1,5 years and the system has worked well. The results have been so promising that now the City of Stockholm will scale up this solution on a district level. In Stockholm the smart connected city will use the extensive fibre network provided and administered by Stokab, a company owned by Stockholm City Council (more information) Several Internet of Things applications and solutions can be developed thanks to the fibre network. The implementation of sensors in the Slakthusarea is soon finalised. Most of the sensors for vehicle traffic flow measurements are now installed and most of the wifi-based sensors are going to be installed within the next two weeks. IBM, who is responsible for the open consolidated big data platform (solution 8), will build up a multiuseable data platform where real-time data can be analysed, but also were the data can be turned into practical usecases reducing transport emissions and increasing the quality of life for citizens. The development work will be done in an agile process were users from different city organisations work together with IBM:s development team. Fortum’s open district heating (solution 6) system has been operating during the heating season and has given better results than expected. The heat recovery can thus heat up more than the earlier calculated 700 apartments. The waste handling system provided by Envac has been running since summer. 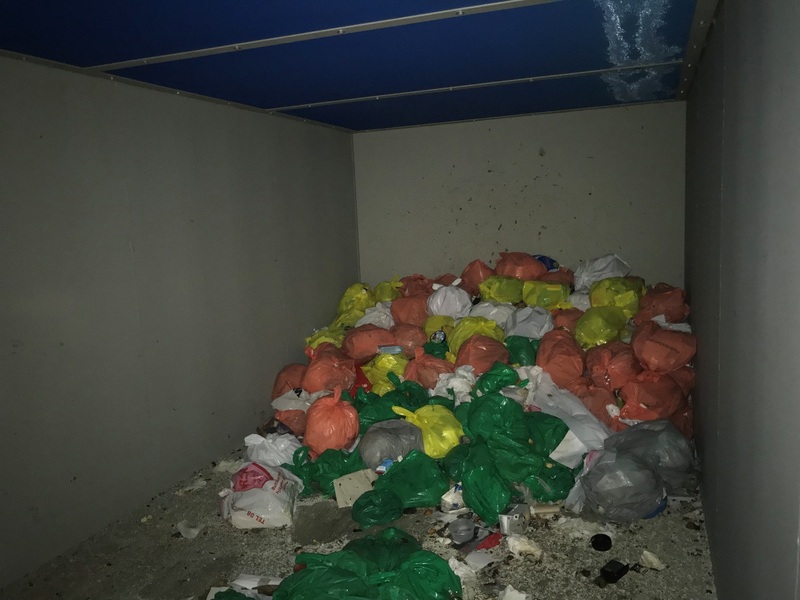 The system has worked well with the bags provided for this purpose, but in some cases the tenants have used other plastic bags which has unfortunately broken. In the picture below you can see how the waste fractions look like inside the container before the delivery to the end sorting facility. The Building logistics centre (solution 2) implemented by Carrier, will start handling more materials for the last buildings to be refurbished in Valla Torg. Carrier has together with Skanska agreed which material streams can be best handled by the logistics centre, and these materials will be handled by the centre during 2018. The implementation of delivery boxes (solution 9) by Carrier is done. The delivery boxes are actually a delivery room, which later on can be used for other purposes. In the room for instance tools could be safely kept and booked by tenants. Insero has together with NOAE (Network of Automotive Excellence) implemented an information system for drivers (solution 10). Effects on travel time and the drivers’ experiences will be evaluated. KTH has developed a smart phone application (solution 10) to follow up changes in travel behaviour. In the same application, information about renewable fuels in Stockholm will be shown. The application is launched. The first four refuelling stations (solution 11) for renewable fuels are up and running. The filling station in Årsta is expected to be built in 2018. Stockholmshem launched yesterday its electrical carpool (solution 12) for tenants and habitants. In Stockholm Emma Borggren-Franck has taken the responsibility of the demonstration of smart solutions. Several study visits have been organised and still more are planned for this year. There has also been a great interest for presentations of the smart solutions implemented in Stockholm. A few weeks ago we presented our experiences in Brussels and last week I was in Wien and Bratislava presenting results and experiences. In spring there are two events planned. One will be focused on the smart solutions in Slakthusarea and the second one on smart solutions for tenants in Valla Torg. 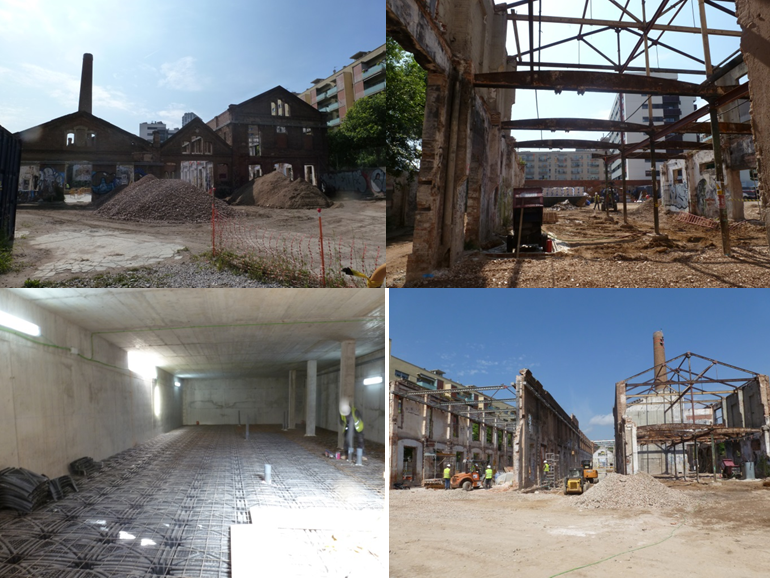 The personnel from Skanska and Stockholmshem have been working hard to finalise the buildings so that the tenants can start moving back as planned in September. In the last weeks, construction workers have been working nights and weekends to accomplish this. Now the first tenants have moved in and can start using all the smart solutions we have implemented. As soon as the heating season starts (we all wish the first snow would just come!) we can start getting some indications on how energy efficient the buildings are. In this building the tenants have the possibility to use the Active House application from Fortum to control the temperature and lighting in the apartment. The other two buildings under construction are also well on their way. The first half of the low-storey building 8 is finalised and in September tenants moved in. The other half will be finalised later this autumn. The second multi-storey building 6 is going to be finalised by the end of this year. The smart LED-street lights (solution 5) have now been in operation for a year. In Stockholm the smart connected city will use the extensive fibre network provided and administered by Stokab, a company owned by Stockholm City Council (more information). Several Internet of Things applications and solutions can be built on top of the fibre network. The implementation of sensors in the Slakthusarea has started. IBM, who is responsible for the open consolidated big data platform (solution 8), will analyse data to show how people move around in the Slakthusarea. This starts as soon as the sensors can provide data in October. The project team, platform for data management, analysis tools and methodology are all in place. Fortum’s open district heating (solution 6) system is now installed in the datacentre. The heat recover can heat up approximately 700 apartments. The waste handling system provided by Envac was completed by the end of June. The pipelines, inlets and terminal of the smart waste handling system (solution 7) are in place. The terminal and inlets are now being installed. The Building logistics centre (solution 2), implemented by Carrier, will start handling more materials in autumn. Carrier has together with Skanska agreed which material streams can be best handled by the logistics centre, and these materials will be handled by the centre when the next phase of the refurbishment begins later in the autumn. The implementation of delivery boxes (solution 9) by Carrier is being done alongside refurbishments of buildings in Valla Torg. When the tenants move back into their apartments starting in September, they can order packages and other deliveries straight to their homes instead of retrieving them from the nearest service point. The delivery from the service point to the building is carried out with cargo bikes. KTH has developed a smart phone application (solution 10) to follow up changes in travel behaviour in a way that is more effective and has a greater response rate than traditional travel surveys. This will improve travel demand management measures. In the same application, information about renewable fuels in Stockholm will be shown. This information includes updated information on where each alternative fuel can be tanked, together with the most recent prices. The application will be launched when tenants have moved back later this autumn. The first three refuelling station (solution 11) for renewable fuels are up and running. The filling station in Årsta is expected to be built in the beginning of 2018. In Stockholm several study visits have been arranged and there is high interest in the GrowSmarter solutions. As more and more smart solutions are implemented, the study visits will become more frequent. In October 2017 there will be an event demonstrating the smart solutions in Valla Torg. Here the focus is on city representatives. In November/December 2017 a similar event will be arranged in Slakthusarea. In spring 2018 an event is planned for tenants in Valla Torg. 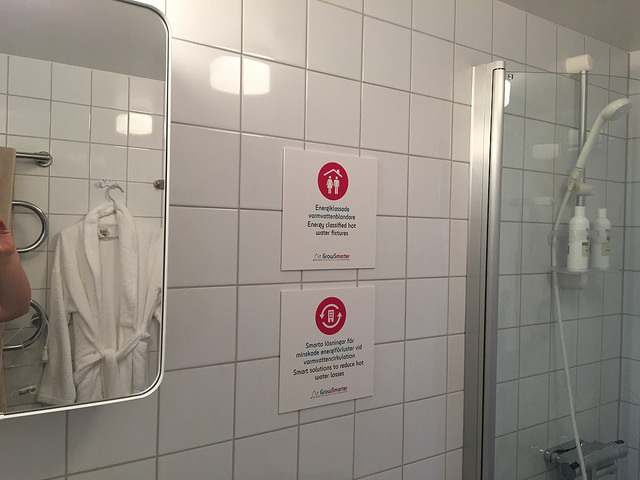 A video has been produced showcasing the smart solutions implemented in Stockholm. The video can be seen here. 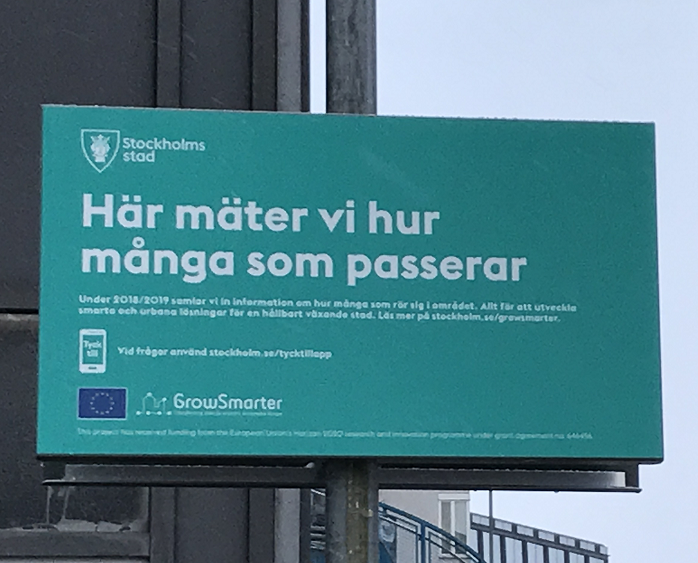 GrowSmarter has reached a milestone year: by the end of 2017, all the smart solutions will be in place and in use in Stockholm. Smart solutions from each area of action have already been implemented, so the work is now shifting from implementation to demonstration and evaluation of the project. A lot of emphasis is put on communication and marketing activities in 2017 and 2018. Each partner will make a communication plan and contribute to the demonstration site’s general communication activity plan, but also look into how the smart solutions can be marketed internationally. What’s happening in Valla Torg, Årsta and the Slakthus area buildings? 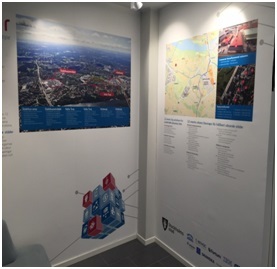 The smart solutions for low energy districts will be rolled out in the building zones in Valla Torg, Årsta and the Slakthus area (see map here). For an overview of the measures being implemented, click here. In Valla Torg The refurbishment of the first higher storey building (7G) started in September 2016. Insulation of facades, installation of new windows and other climate shell related measures were carried out by Skanska. 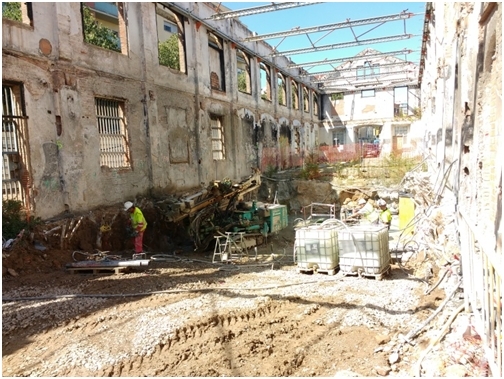 The refurbishment of the first lower storey building (8H) started in October 2016. Work on insulating facades and changing windows has already been done, and other climate shell measures will be finalised by the end of March 2017. 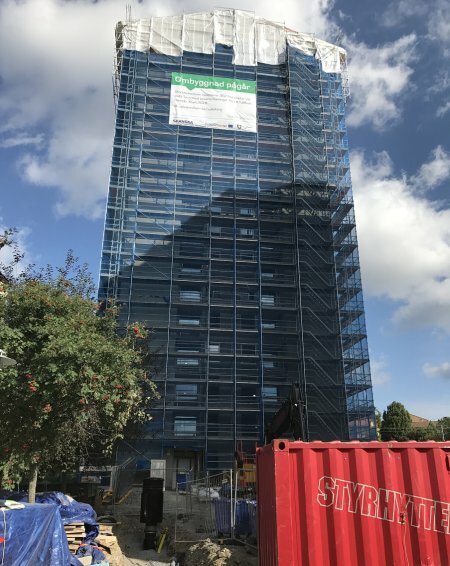 The refurbishment of the second higher storey building (6F) started in December 2016. All of the measures to be implemented are part of the energy efficient climate shell (solution 1). 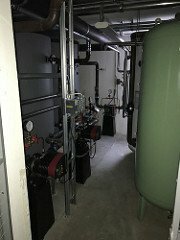 In the private condominia, Brf Årstakrönet, the implementation (solution 1) and (solution 3) started in January 2016 with the installation of an adaptive control system by Veolia. Veolia has also installed photovoltaic arrays (solution 4) on the roofs. The solar energy production is connected with energy storage (batteries), so that solar energy can be stored and used when it’s needed. The same solutions will also be implemented in the Slakthus area buildings during later stages of refurbishment. 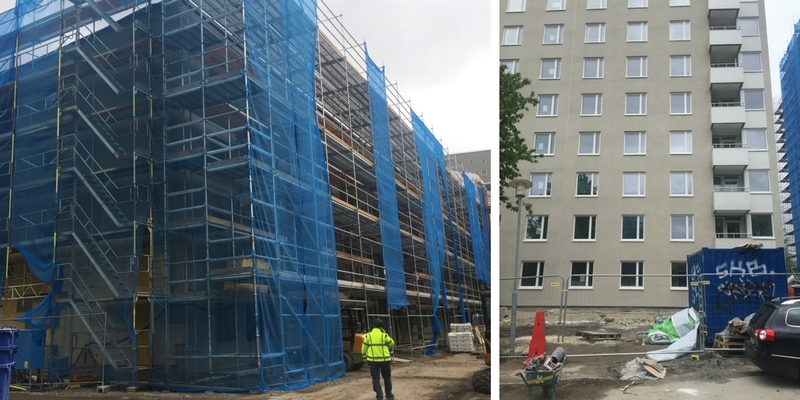 In Slakthus the refurbishment of building 8 by the Fastighetskontoret (Real Estate Administration Office) started in October 2016. Unfortunately, the overall budget for the Real Estate Administration was cut, so the second building (building 7) cannot be refurbished in 2017 as planned. Therefore, we are working on finding a replacement building. The alternative building will also be situated in Slakthus area. 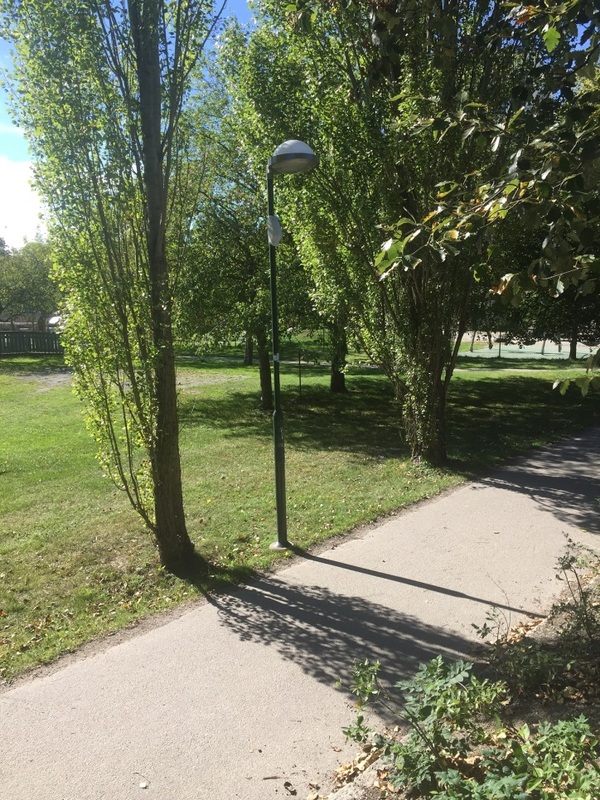 As described in an earlier blog, the installation of smart LED-street lights (solution 5) was finalised in June 2016 in Valla Torg and has now been in use for a full winter season. The measure will bring an estimated 50% energy savings, but actual figures have not yet been analysed. In Stockholm the smart connected city will use the extensive fibre optic network provided and administered by Stokab, a company owned by Stockholm City Council. Several Internet of Things applications and solutions can be built on top of the network. In April 2017 sensors will be installed in the Slakthus area. One set of sensors will measure the pedestrian and bicycle traffic in the area. Another set of sensors will analyse vehicle traffic. We are especially interested in understanding how people travel to events that take place in this area: there are three sports arenas situated close to each other which host events year-round. We will also install sensors for measuring air pollution. These will be placed in the same locations as the vehicle transport sensors. The real-time data that is collected will be delivered to an open consolidated big data platform for further analysis. A workshop with city departments and other interested parties is planned for the 8th of March to define the types of analysis to be done. Later in spring when the first set of data has been analysed, further workshops will be planned to define what kind of applications can be developed for lowering transport-based emissions based on the real-time data. In doing this we are defining ways to provide higher quality of life for citizens with smart connected solutions. IBM, who are responsible for the open consolidated big data platform (solution 8), have two ongoing roles in GrowSmarter: “Sensing City Scale people movement” and “Movement of Pedestrians/Bicyclists”. Under “Sensing City Scale people movement” IBM will analyse data on the flow of people to show how people move in the Slakthus area over time by creating heat maps. This analysis will be combined with other data such as public transport capacity, traffic measurements, weather, etc. to see how well the different transportation modes and capacities are optimised in the area, especially during events with a lot of people in motion. The project team, platform for data management, analysis tools and method are all already in place. In “Movement of Pedestrians/Bicyclists” IBM will measure and study in detail specifically how pedestrians move in the city. A prototype user interface environment has been developed on the Bluemix platform. Sample data sets from relevant data sources have been uploaded into the Bluemix environment and made available for users, including vehicle traffic measurement data, bicycle traffic measurement data, bicycle accident data, and weather data for specific locations in the city. End user functions and graphical visualisation tools have been developed. Together with the Traffic Administration, a plan for implementing new sensor data sources has been made. There will be 7 video sensors in the city connected via the fibre optic network to the Bluemix platform, which will feed into the traffic planner user environment in Bluemix. These sensors will be able to measure the flow, volume and direction of pedestrians, cyclists and vehicles in the selected city areas covered. Fortum’s open district heating (solution 6) will be implemented in two locations. 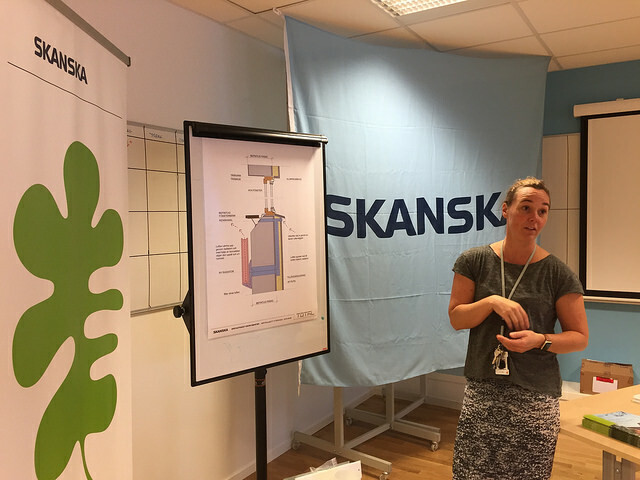 In Västberga, waste heat from data centres will be integrated into the district heating system.The same will be done for waste heat from Supermarkets in Farsta (some 5km south of the Slakthus area). The agreements have been signed and the installation in the Supermarket is completed. Due to delivery problems the heat pump could not be delivered as planned in March, so the installation in the data centre is postponed until June. 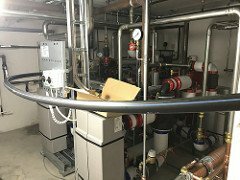 When the solutions are in operation, the waste heat collected can be distributed into the district heating system and provide heat and hot water to more than 1,000 apartments. The waste handling system provided by Envac will be completed in June this year, with the terminal and inlets being installed during spring 2017. The different waste types will be separated by tenants into different coloured bags. The tenant places the bags in the inlet, and each bag colour is automatically identified and measured. Data from all six buildings in the project will be collected. The waste is then transported in underground pipes to the terminal. From the terminal the waste bags are sent to the sorting facility, where the different coloured bags are separated for recycling. The smart waste handling has several benefits. It saves space compared to conventional waste containers, which can then be used for other purposes. The system also brings about benefits for hygiene and reduces bad odours. As the waste is piped to the terminal for collection, traffic for collecting waste at buildings will be reduced, meaning reduced traffic emissions but also less noise at residential buildings. 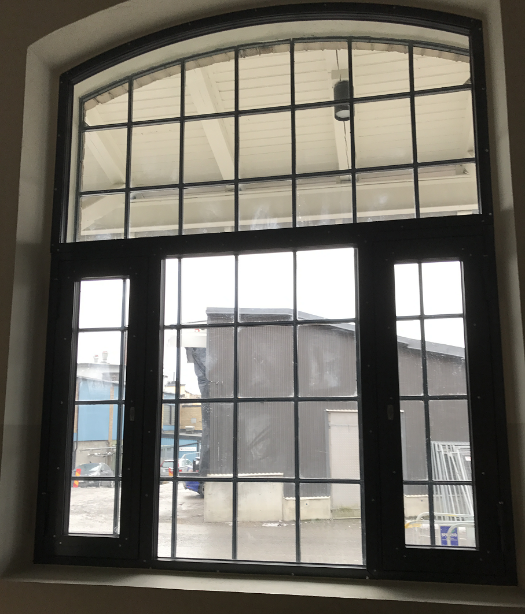 The building logistics centre (solution 2), implemented by Carrier, started in September 2016 with the delivery of windows to Valla Torg. Carrier is together with Skanska discussing which material streams can be best handled by the logistics centre. The construction logistics are part of the production process, so the better production is planned and organised, the easier it is to provide just-in-time deliveries to construction sites. The materials are delivered outside work hours (after 5pm) so that they are available in the next morning at the construction site. The implementation of delivery boxes (solution 9) by Carrier will be done in three buildings as part of the 2017 refurbishment plan in Valla Torg. Tenants can order packages and other deliveries straight home instead of picking them up from the nearest service point. The delivery from the service point to the building is done by cargo bikes. Insero, together with NOAE (Network of Automotive Excellence) and Global car OEM, is implementing an information system for drivers (solution 10). In Stockholm ten traffic lights are equipped with software that can communicate and relay information about the status of the light and when it is about to switch. This is achieved through a data connection between the traffic light, the cars’ onboard software and GPS, and a central computer handling the calculations. Through a special device in the car, the driver will receive information about what speed to drive in order to reach a green light at the next junction. This information tool will be tested in two cars starting in March 2017. Effects on travel time and the drivers’ experiences will be evaluated. KTH has together with Info24 (now Tingcore) developed a smartphone application (solution 10) to study changes in travel behaviour in a way that is more effective and has a greater response rate than traditional travel surveys. This will improve the travel demand management measures. In the same application, information about renewable fuels in Stockholm will be shown. This information contains updated information on where each alternative fuel can be tanked, together with most recent price. As part of the GrowSmarter project, Fortum has planned to install up to 10 charging stations and one fast charger (solution 11). The fast charger is installed in Årsta. The normal chargers will be installed in Valla Torg, Slakthus area and Årsta during 2017. The first refuelling station (solution 11) for renewable fuels is up and running. The filling station in Årsta is expected to be installed in the beginning of 2018. In Stockholm several study visits have been arranged and there is a great interest in the GrowSmarter solutions. As more and more smart solutions are implemented, the study visits will become more frequent. In August 2017 there is a plan to have an event demonstrating the smart solutions in Valla Torg. Here the focus is on city representatives. In November/December 2017 a similar event will be arranged in the Slakthus area. In spring 2018 an event is planned for tenants in Valla Torg. All Stockholm partners will produce their own communication activities plan in April, and contribute to an overall communication activities plan for the Stockholm site. In addition, the partners will start producing a marketing plan for their smart solutions as soon as the implementation is completed. GrowSmarter is a complex project in which many solutions are linked to each other and both planning and implementation must happen in an integrated manner. This is very evident in Valla Torg, where the tenants must first vacate the buildings before the smart solutions can be implemented in and around the buildings. As this process didn’t start as planned in February 2016, but rather in August, we are now in a very hectic implementation phase where everything happens at the same time, as we still need to keep the original timetable. In this blog I will explain in more detail everything that will happen in the next few months to come. For those of you who didn’t have a chance to read my previous blog posts, the smart solutions for low energy districts will be rolled out in three building zones, namely Valla Torg, Årsta and the Slakthus area (see map here). For an overview of the measures being implemented, click here. In Valla Torg tenants began leaving the buildings in August and the first high-story building has scaffolding (pictured). Work on the façade will start in October. The walls will receive more insulation and new energy-efficient windows will be installed by Skanska. The interior work will also start at the same time. Old pipelines will be removed and new insulated pipelines will be installed. All these measures are part of the energy efficient climate shell (solution 1). 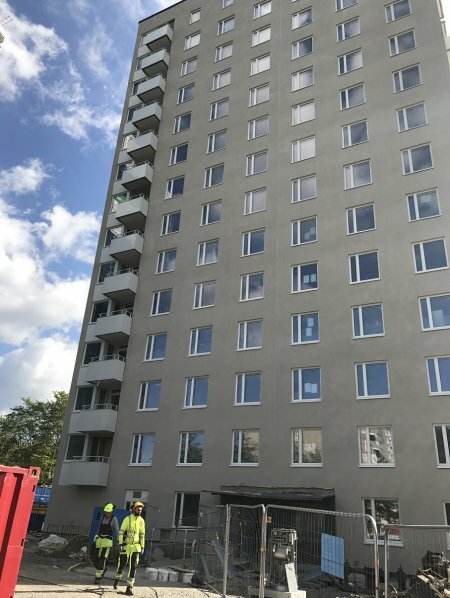 In the private condominia Brf Årstakrönet, the refurbishments (solution 1) and (solution 3) started in January 2016 with the installation of an adaptive control system by Veolia. Veolia will also install photovoltaics (solution 4) on the roofs upon receiving the building permit. The same solutions will also be implemented in the Valla Torg and Slakthus area buildings during later stages of refurbishment. 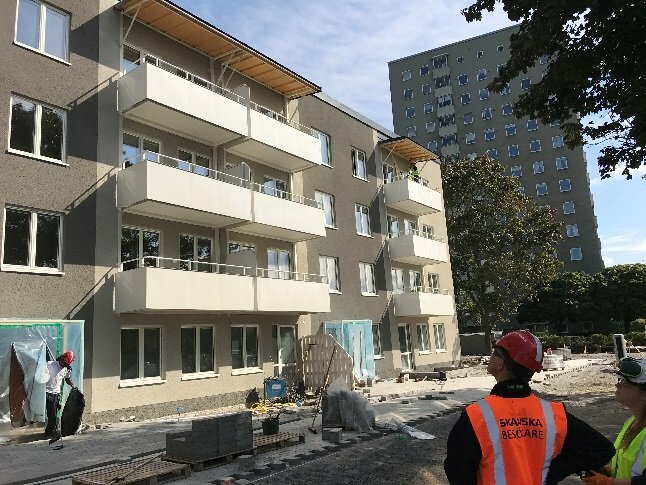 The real estate administration office (Fastighetskontoret) has made a procurement of a building contractor for Slakthusarea, but the decision has been appealed. As soon as the court has given its decision the work can continue. The installation of smart LED-street lights (solution 5) was finalised in June in Valla Torg. The adaptive LED-lighting will reduce energy consumption by 50% while still providing the same sense of security along walking and bicycling paths. Each street light features a radar detector that senses movement on the path (Picture). As soon as any movement is detected, the light is activated and the movement is communicated wirelessly by radio to a number of nearby street lights. As a result, cyclists and pedestrians experience normal illumination levels along their entire route. In Stockholm the lights are not fully turned off during periods without movement, but rather dimmed down and then activated to full light as soon a person approaches. Fortum’s open district heating (solution 6) will be implemented in two locations. Waste heat from Data Centres in Västberga and waste heat from Supermarkets in Farsta (some 5km South of the Slakthus area) will be integrated into the district heating systems. The agreements have been signed and the installations will begin in October-November. 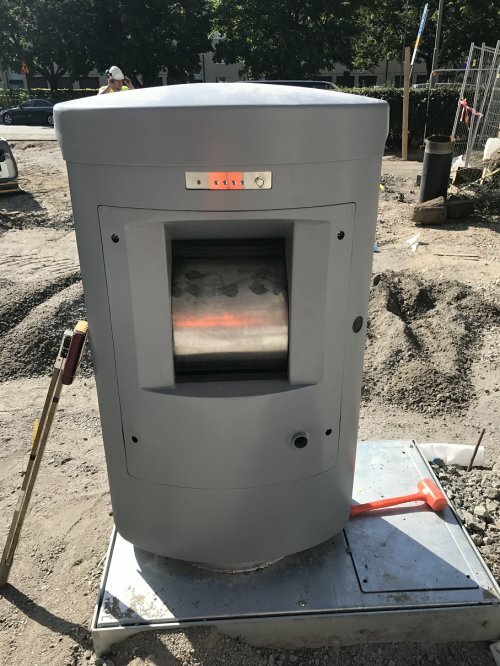 When operational, the waste heat collected will be distributed into the district heating system and provide heat and hot water to more than 1,000 apartments. In Stockholm the smart connected city will use the extensive fibre optic network provided and administered by Stokab, a company owned by Stockholm City Council. Several Internet of Things applications and solutions can be built on top of the fibre optic network. Together with different departments and city owned companies, we are defining ways to provide higher quality of life for citizens with smart connected solutions in a series of workshops. We will start the process with defining the users’ needs. We have defined three groups of users: inhabitants, visitors and companies. In the Slakthus area we are focussing on visitors and companies, while in Valla Torg the focus is on inhabitants. In my last blog I addressed some of the activities in the Slakthus area, so in this blog I will cover how apartments with simple installations can provide many new functions. In residential houses, as the tenants change over time, we should install equipment which can be used by several end users and for several purposes. Let’s say we install a movement sensor and water meters in every apartment. If the inhabitant is old, maybe the relatives would like to have a way to monitor her well-being. For example, a simple alarm function could be built and an automatic message sent to relatives when the motion sensor senses the person is inside the apartment, but has not used water for 12 hours. We can also collect water use data and the housing company could, for instance, detect leakages when water is being used and no one is home. If we realise that people use water in different ways, from very little to very intensively, we can create individual water billing so that everyone only pays for the water they use. IBM, who are responsible for the open consolidated big data platform (solution 8), are involved in two parts of the project: “Sensing City Scale people movement” and “Movement of Pedestrians/Bicyclists”. In “Sensing City Scale people movement” IBM planned to analyze mobile phone data and create heat maps to show how people move in the city over time. This analysis was to be matched against other data such as public transport capacity, traffic measurements, weather, etc. to see how well the different transportation modes and capacities are optimised in the city. The project team, platform for data management, analysis tools and method are all in place. A subcontractor was identified and final negotiations for delivery of Telco data were in progress at the beginning of 2016, with the project start scheduled for 1 February 2016. But an unexpected issue arose. Based on a thorough legal assessment of the current Swedish Personal Data Legislation (PUL) and the EU General Data Protection Legislation (EU GDPL), the subcontracted Telco cannot provide the requested mobile telephone data for citizens of Stockholm in a way that would make it useful to the use case defined by IBM Research Dublin Lab. The only legally approved way for getting access to mobile phone trajectory data is to ask the citizens to voluntarily participate in the project and thus explicitly give consent for the project to track the movements of their mobile phones over time. The merits, challenges and feasibility of this alternative approach will be assessed by the City of Stockholm and IBM, and a decision on whether to attempt this approach - by consent will be made in 3Q 2016. In “Movement of Pedestrians/Bicyclists” IBM will measure and study in detail especially how pedestrians move in the city. A prototype user interface environment has been developed in the Bluemix platform. Sample data sets from relevant data sources have been uploaded into the Bluemix environment and made available for the users, including vehicle traffic measurement data, bicycle traffic measurement data, bicycle accident data, and weather data for specific locations in the city. End user functions and graphical visualization tools have been developed, e.g. new work project definition, traffic data selection, report generation, and graphical data visualization. A plan for implementing new sensor data sources in Aug/Sept 2016 has been agreed upon with the Traffic Administration. This will consist of 7 video sensors in the city infrastructure connected through the city fiber optic network to the Bluemix platform. Data from these sensors will be uploaded into the traffic planner user environment in Bluemix. These sensors will be able to measure the flow, volume and direction of pedestrians, cyclists and vehicles in the selected city areas covered. The underground parts of the smart waste handling system (solution 7) provided by Envac will be implemented in October and November (pictures). The terminal and inlets will be implemented during the beginning of 2017. The waste is compacted right below the waste inlet in the storage pipe instead of upon arrival to the waste terminal. The compacted waste allows for smaller pipes and a reduction of the airflow by as much as 50%. These factors together result in a reduction of energy consumption up to 50%. The solution will consume less energy per tonne of collected waste than any other comparable traditional waste collection, including ordinary waste collection vehicles. The building logistics center (solution 2) and delivery boxes (solution 9) will be implemented by Carrier starting in October and November. The location of the buildings logistics centre has changed and will now be in Slakthus area. Carrier has together with Skanska discussed which material streams can be best handled by the logistics centre. The construction logistics are part of the production process, so the better production is planned and organised, the easier it is to provide just-in-time deliveries of materials to construction sites. Typically the materials are delivered outside work hours (after 5pm) so that they are available the next morning at the construction site. There are several benefits of the construction logistics centre. First, there are fewer materials wasted and damaged at the construction site, along with less traffic to and from the construction site. The construction site can also be kept clean, as the packaging waste is regularly removed. What’s more, production is enhanced as materials needed for work are constantly available and it is always clear where the materials are and how much is in stock. Delivery boxes (pictured) are installed in the entrance of the refurbished buildings in Valla Torg next to the post-boxes. Tenants can order packages and other deliveries straight to their homes instead of retrieving them from the nearest service point. The delivery from the service point to the building is done by cargo bikes. Insero, together with NOAE (Network of Automotive Excellence) and Global car OEM, is implementing an information system for drivers (solution 10). In Stockholm around ten traffic lights will be equipped with software that can communicate and inform users about the status of the light and when it is about to change. This is achieved through a data connection between the traffic light, the cars’ onboard software and GPS, and a central computer handling the calculations. Through a special device in the car, the driver will receive information on what speed to adopt in order to reach a green light at the next intersection. This information tool will be tested in two cars for a few months’ time. Effects on travel time and the drivers’ experiences will be evaluated. As part of the GrowSmarter project, Fortum has planned to install up to 10 charging stations and one fast charger (solution 11). The fast charger will soon be installed in Årsta. The location has been selected and the charger has already been delivered. The normal charging stations will be installed in Valla Torg, the Slakthus area and Årsta. The first refuelling station (solution 11) is up and running (picture). 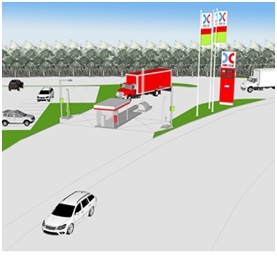 The filling station in Årsta is expected to be established in the beginning of 2017. 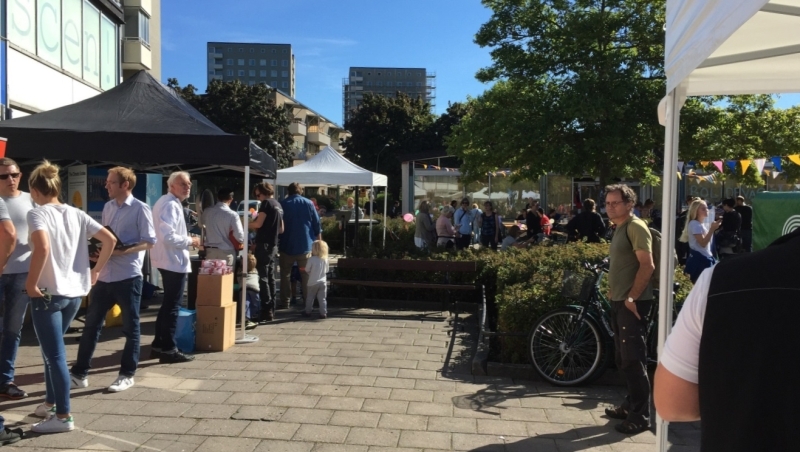 A citizen engagement event was organised in Valla Torg in September. The event was very successful with around 500 visitors and positive feedback. 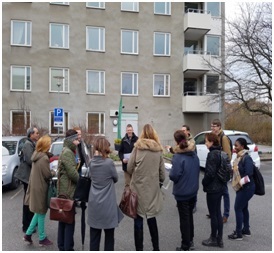 The event was also the launch of the refurbishment in Valla Torg, and the audience had the opportunity to get information both on the GrowSmarter project and the different smart solutions from our partners, and to visit the exhibition apartments.